WASHINGTON, D.C. -- Forty-five percent of Americans are satisfied with the position of the United States in the world, a 13-year high and a 13-percentage-point increase from one year ago, just after President Donald Trump took office. The public is also more likely than it was a year ago to think the U.S. rates favorably in the eyes of the rest of the world. 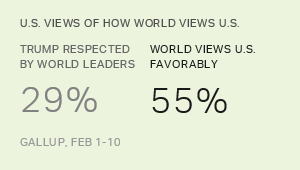 At the same time, however, Gallup sees no change in Americans' opinions of how other world leaders view Trump. Only 29% say he is respected, the same as a year ago. The trends in these three measures of how Americans assess the United States' place in the world have each followed different paths since 2016, the final full year of Barack Obama's presidency. 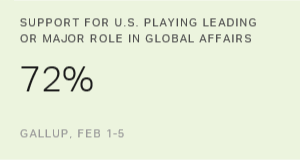 The belief that leaders of other countries respect the U.S. president dove from 45% in Obama's final year to 29% last year, and has not recovered at all. The percentage of Americans satisfied with the nation's position in the world dipped slightly from 36% in 2016 to 32% in 2017, but then surged to 45% this year -- the highest in 13 years. A majority of Americans in 2016 (54%) believed the world rated the U.S. favorably. The percentage with that view fell to a near-record low of 42% last year, then bounced back to 55% this year. The double-digit declines recorded when Trump took office last year might seem to have been linked -- resulting from a general sense that a Trump presidency would be poorly received abroad. But if there was a link in the public's minds, it has been broken this year, as Trump's "respect" numbers have failed to improve, while the percentage who think the rest of the world views the United States favorably has rebounded to pre-Trump levels. 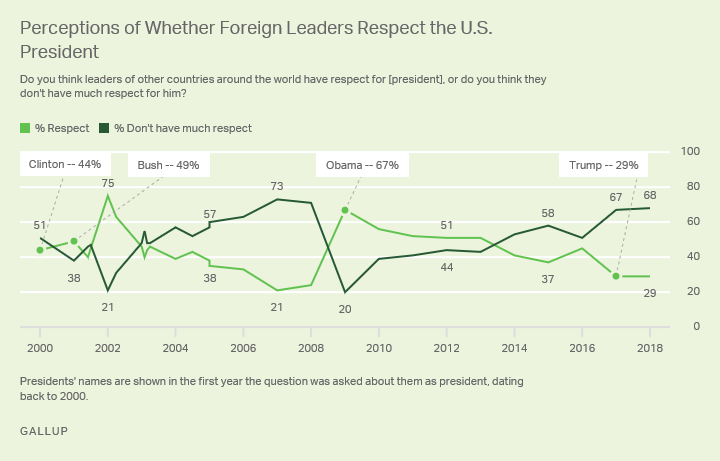 Meanwhile, even as the vast majority of Americans continue saying foreign leaders do not respect Trump, the public is more likely to express satisfaction with the nation's position in the world than at any point since 2005. The 29% of Americans who say foreign leaders respect Trump is significantly lower than the percentage who believed that about Obama at any point in his presidency. At the start of Obama's presidency, 67% believed other world leaders respected Obama. The percentage holding that view drifted downward through the years Obama was president, but never fell below 37%, where it bottomed out in 2015 before rising to 45% in his last year in office. Views on the respect foreign leaders had for Obama's predecessor, George W. Bush, varied greatly over the course of his presidency. In February 2002, a few months after the Sept. 11 terrorist attacks on New York City and Washington, D.C., 75% said they thought world leaders respected Bush, but that had fallen to 21% by 2007 amid public unhappiness with the way he was handling the Iraq War. Sixty percent of Republicans say they think foreign leaders respect Trump, the same as last year. That number is considerably lower than the 79% of Democrats who in 2016 said Obama was respected. Only 4% of Democrats now say Trump is respected, compared with 15% of Republicans thinking Obama was respected in 2016. This year, 45% are satisfied with the position of the U.S. in the world -- essentially matching the average of 46% for the 22 times the question had been asked previously, going back to 2000. Only six times have a majority of Americans said they were satisfied -- in 2000, 2001, 2002 and three times in 2003 -- once before and twice shortly after the invasion of Iraq. The increase from last year's 32% is driven by Republicans (79% satisfied now vs. 47% last year), men (50% satisfied now, 35% last year) and those aged 55 or older (53% now, 34% last year). Satisfaction among Democrats has changed little in the past year, from 19% in 2017 to 15% now. With partisan views driving the overall satisfaction levels on this question, the positive views of Republicans today are a major reason why satisfaction is higher than in the final year of Obama's presidency when a slim majority of Democrats were satisfied (52%). The 55% majority of Americans who think the rest of the world views the U.S. favorably marks a return to the more positive attitudes about world opinion that marked most of the Obama years. 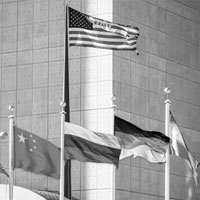 Last year's decline in this measure to 42% reflected sharply lower percentages of Democrats and independents believing the world viewed the country favorably. This included a fall from 68% to 32% among Democrats and from 55% to 41% among independents. Though Democrats' attitudes this year, at 36% favorable, are fairly similar to their views last year, 50% of independents now think the U.S. rates favorably, and Republicans have gone from 39% in 2016 to 54% last year and 80% now. Trump's inauguration last year was met with public concern that his "America First" policy would be unpopular with other nations and their leaders. 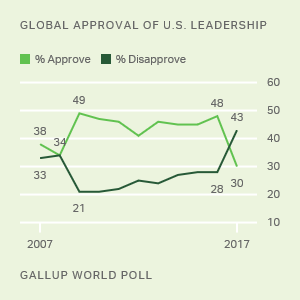 A major report from Gallup, based on polling in 134 countries and areas, confirms that ratings of U.S. leadership have fallen in the year since Trump took office to a record median low of 30%. Although the world has soured on U.S. leadership, Americans are now more likely to be satisfied with the United States' position in the world than at any point in the Obama presidency -- even though they are no more likely than a year ago to approve of Trump's handling of foreign affairs or foreign trade. The change in views of the U.S. position in the world is being driven by an increase in satisfaction among Republicans, though their views on respect for Trump among world leaders have not changed. As Trump continues to issue provocative tweets about foreign allies and enemies, and as the White House moves forward on possible changes to major trade agreements and military alliances, the results and their repercussions could bring another year of major revisions to American attitudes on the nation's standing in the world. Results for this Gallup poll are based on telephone interviews conducted Feb. 1-10, 2018, on the Gallup U.S. Poll, with a random sample of 1,044 adults, aged 18 and older, living in all 50 U.S. states and the District of Columbia. For results based on the total sample of national adults, the margin of sampling error is ±4 percentage points at the 95% confidence level. All reported margins of sampling error include computed design effects for weighting.